1. Privacy is a slogan l l l We talk about privacy as though there was a common understanding of what we mean. This is not true – each culture has its own view of what privacy is and this is no different with legal cultures. 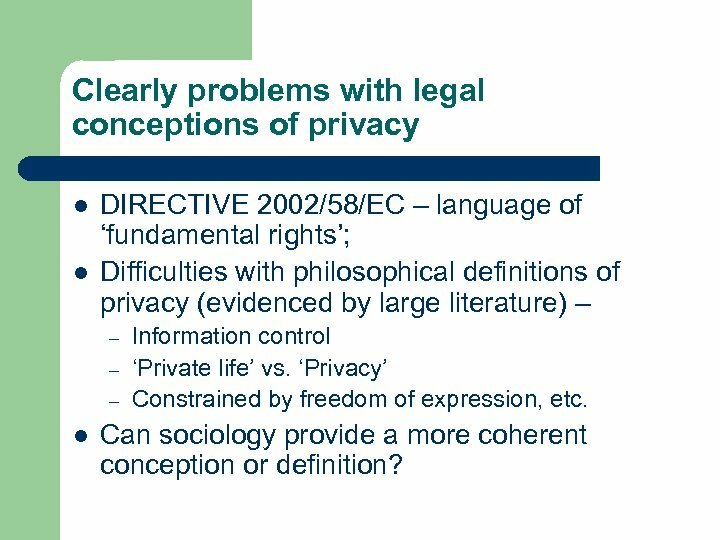 Given that privacy is now viewed as an Art 8 ECHR right, the problem becomes – how do we move from slogan to legal rule. 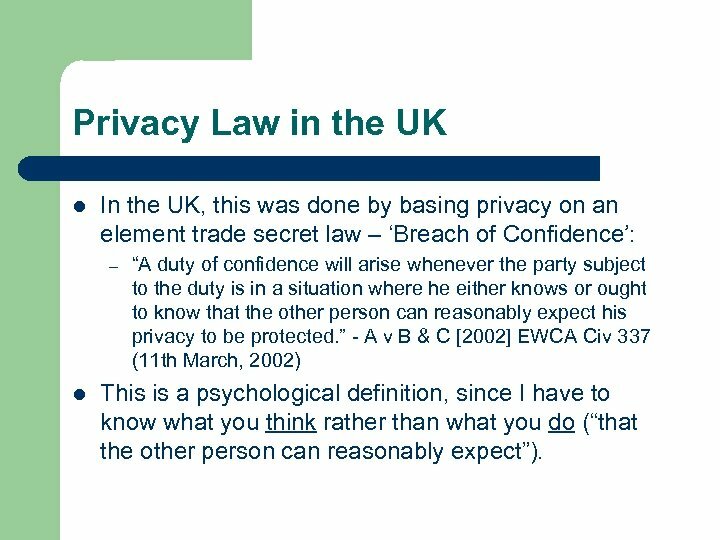 Privacy Law in the UK l In the UK, this was done by basing privacy on an element trade secret law – ‘Breach of Confidence’: – l “A duty of confidence will arise whenever the party subject to the duty is in a situation where he either knows or ought to know that the other person can reasonably expect his privacy to be protected. 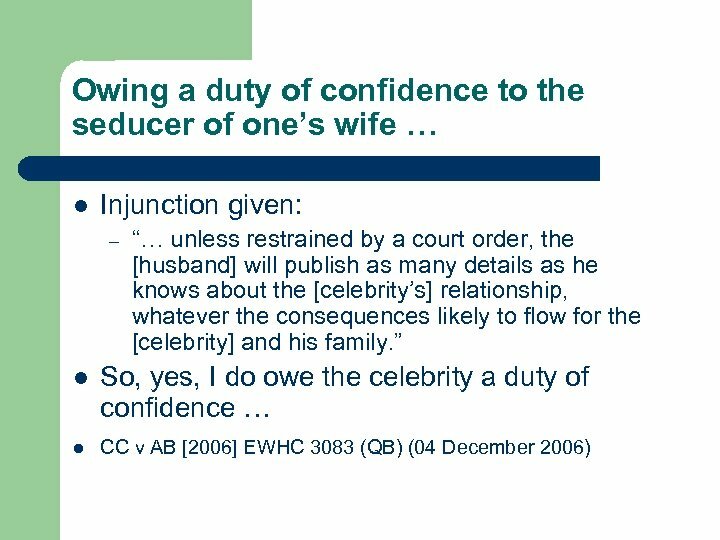 ” - A v B & C  EWCA Civ 337 (11 th March, 2002) This is a psychological definition, since I have to know what you think rather than what you do (“that the other person can reasonably expect”). 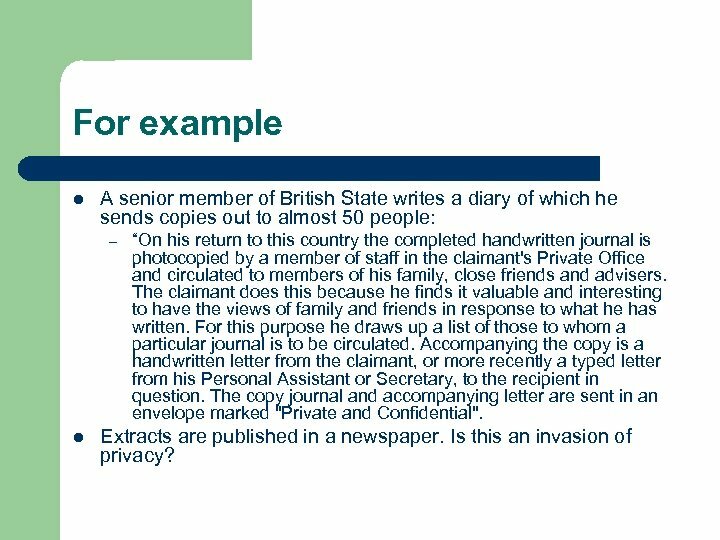 For example l A senior member of British State writes a diary of which he sends copies out to almost 50 people: – l “On his return to this country the completed handwritten journal is photocopied by a member of staff in the claimant's Private Office and circulated to members of his family, close friends and advisers. 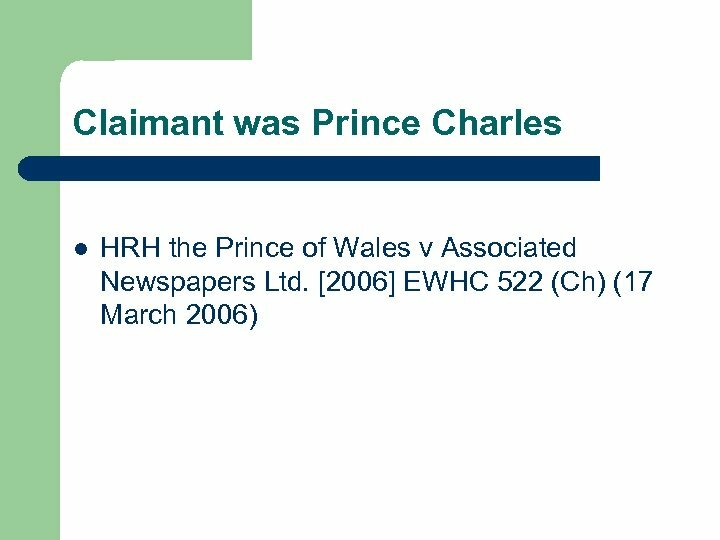 The claimant does this because he finds it valuable and interesting to have the views of family and friends in response to what he has written. For this purpose he draws up a list of those to whom a particular journal is to be circulated. Accompanying the copy is a handwritten letter from the claimant, or more recently a typed letter from his Personal Assistant or Secretary, to the recipient in question. The copy journal and accompanying letter are sent in an envelope marked "Private and Confidential". Extracts are published in a newspaper. Is this an invasion of privacy? Another example … l l You are a married celebrity who has been sleeping with my wife for two years, taking her abroad on holidays etc. Your public image is that of being ‘clean cut’ I want revenge and approach a newspaper. You seek restraint, and suggest that publishing the story is an invasion of privacy. Do I owe you a duty of confidence? What is wrong with these developments? l l It is not dealing with privacy ‘as such’. It gives enormous power to someone to control information which is (effectively) already public. It does not attempt to ‘balance’ freedom of expression rights. It appears sometimes to be an attack upon the press. 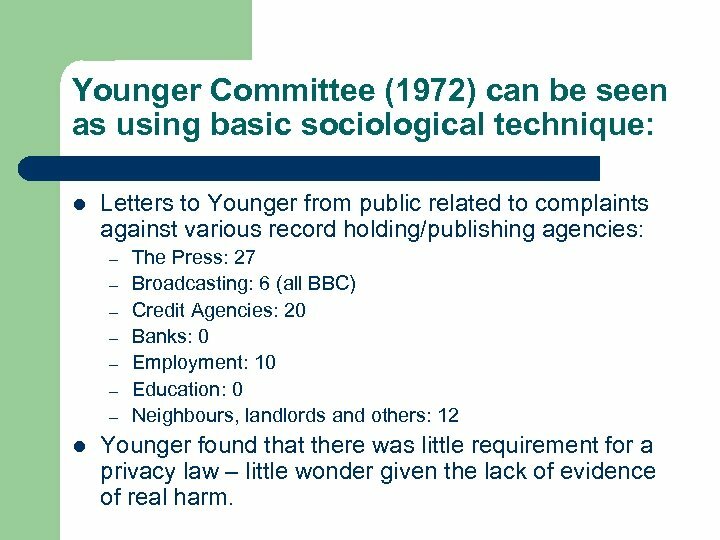 Younger Committee (1972) can be seen as using basic sociological technique: l Letters to Younger from public related to complaints against various record holding/publishing agencies: – – – – l The Press: 27 Broadcasting: 6 (all BBC) Credit Agencies: 20 Banks: 0 Employment: 10 Education: 0 Neighbours, landlords and others: 12 Younger found that there was little requirement for a privacy law – little wonder given the lack of evidence of real harm. 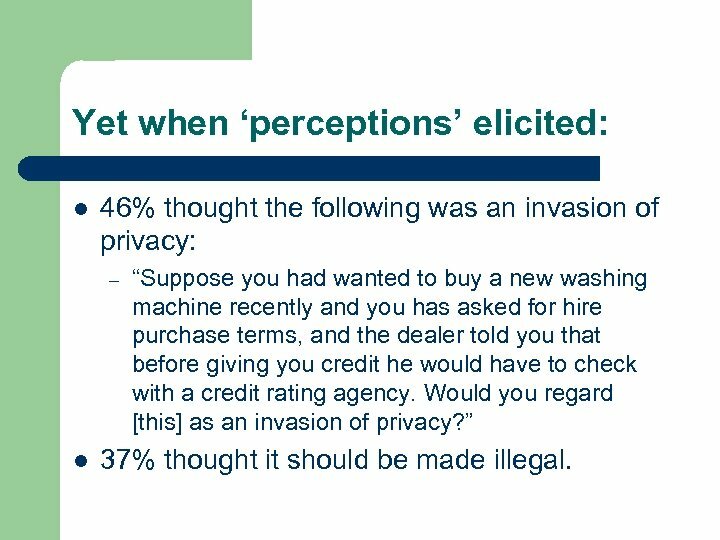 Yet when ‘perceptions’ elicited: l 46% thought the following was an invasion of privacy: – l “Suppose you had wanted to buy a new washing machine recently and you has asked for hire purchase terms, and the dealer told you that before giving you credit he would have to check with a credit rating agency. Would you regard [this] as an invasion of privacy? ” 37% thought it should be made illegal. 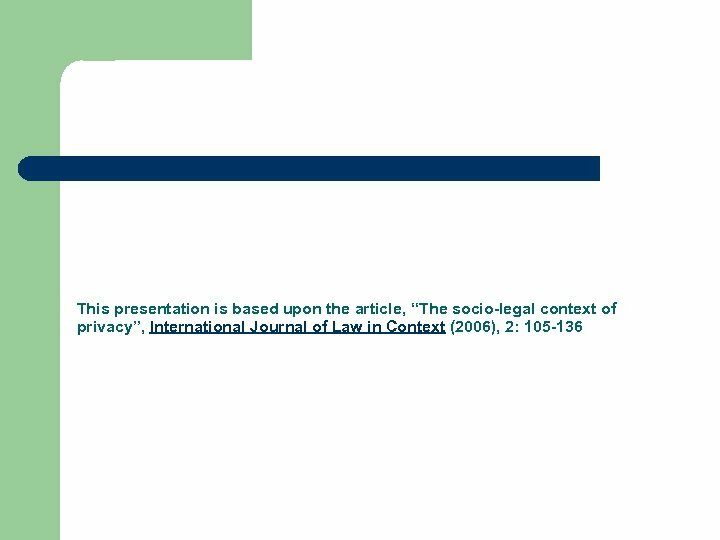 Most current socio-empirical research appears to be focused on ‘perceptions’ l l l For example, ICO funded research into what constitutes ‘personal data’ carried out a large scale trans-national study *. Interesting results, but really tells us little about how the individuals actually use or provide their data (perhaps bemoaning the lack of privacy as they hand over their Tesco club card, for example). 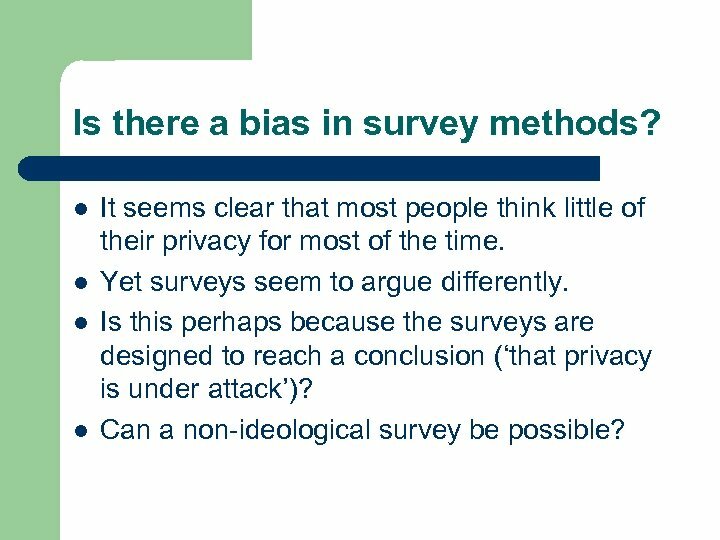 Does not provide a ‘theory of privacy’ which allows us to make sense of the data. 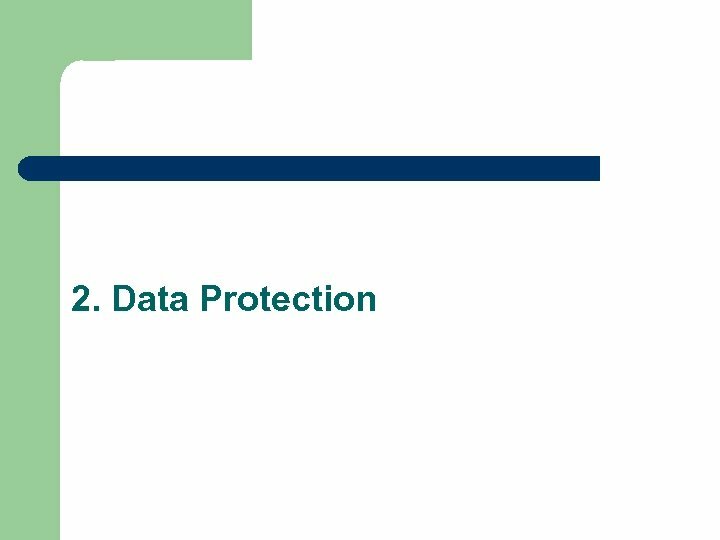 * What are ‘Personal Data’? A study conducted for the UK Information Commissioner, S. Booth et al, 2004. Is there a bias in survey methods? l l It seems clear that most people think little of their privacy for most of the time. Yet surveys seem to argue differently. 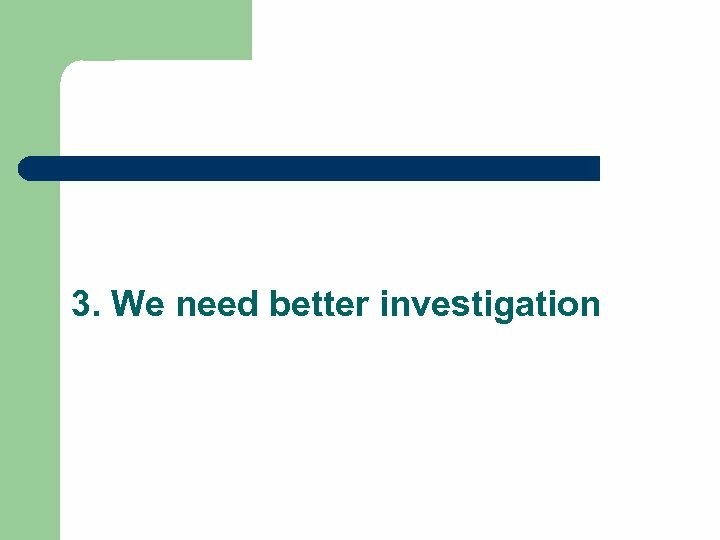 Is this perhaps because the surveys are designed to reach a conclusion (‘that privacy is under attack’)? Can a non-ideological survey be possible? Is DP law actually working? 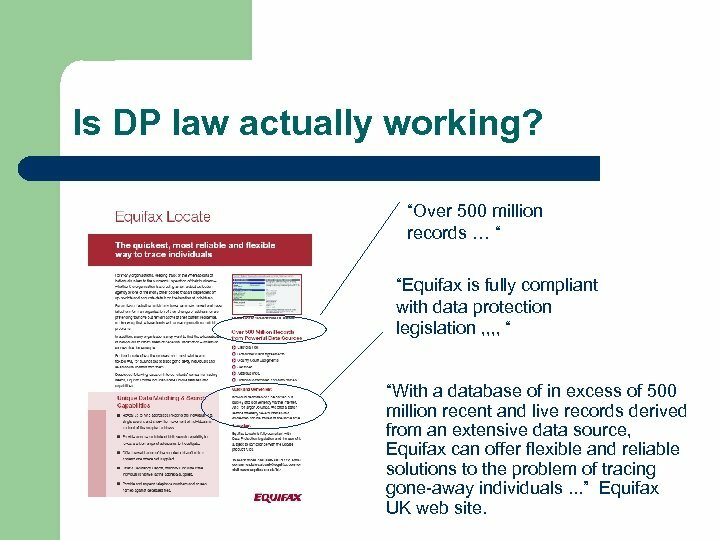 “Over 500 million records … “ “Equifax is fully compliant with data protection legislation , , “ “With a database of in excess of 500 million recent and live records derived from an extensive data source, Equifax can offer flexible and reliable solutions to the problem of tracing gone-away individuals. . . ” Equifax UK web site. Has DP law biased information processing in favour of capital? l l Tools such as data mining, matching and processing of data require large data sets. These tools are advantageous to business in allowing them to target customer need. The companies most able to perform these tasks effectively are those with large data sets – that is, well capitalised and with a large commercial presence. 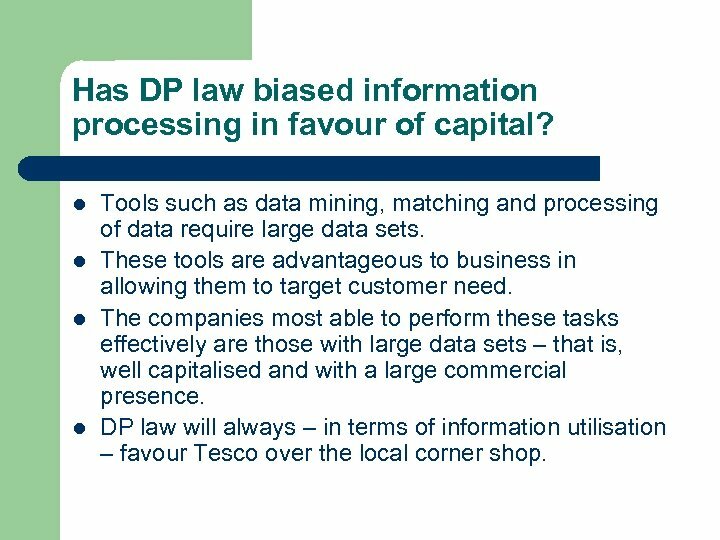 DP law will always – in terms of information utilisation – favour Tesco over the local corner shop. 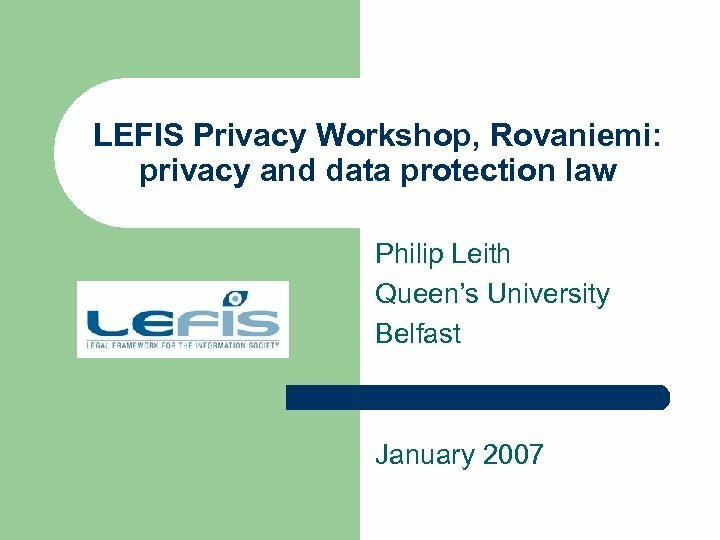 Clearly problems with legal conceptions of privacy l l DIRECTIVE 2002/58/EC – language of ‘fundamental rights’; Difficulties with philosophical definitions of privacy (evidenced by large literature) – – l Information control ‘Private life’ vs. ‘Privacy’ Constrained by freedom of expression, etc. Can sociology provide a more coherent conception or definition? A sociological approach l “Nowadays men often feel that their private lives are a series of traps. They sense that within their everyday worlds, they cannot overcome their troubles, and in this feeling, they are often quite correct: What ordinary men are directly aware of and what they try to do are bounded by the private orbits in which they live; their visions and their powers are limited to the close-up scenes of job, family, neighborhood; in other milieux, they move vicariously and remain spectators. And the more aware they become, however vaguely, of ambitions and of threats which transcend their immediate locales, the more trapped they seem to feel. 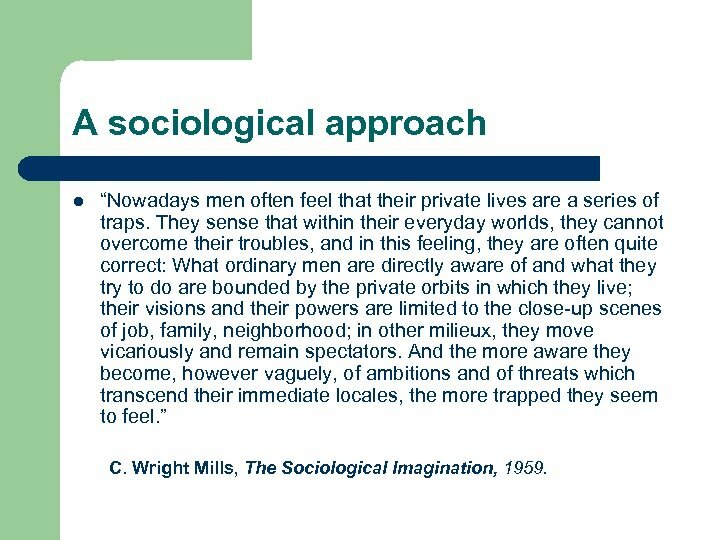 ” C. Wright Mills, The Sociological Imagination, 1959. 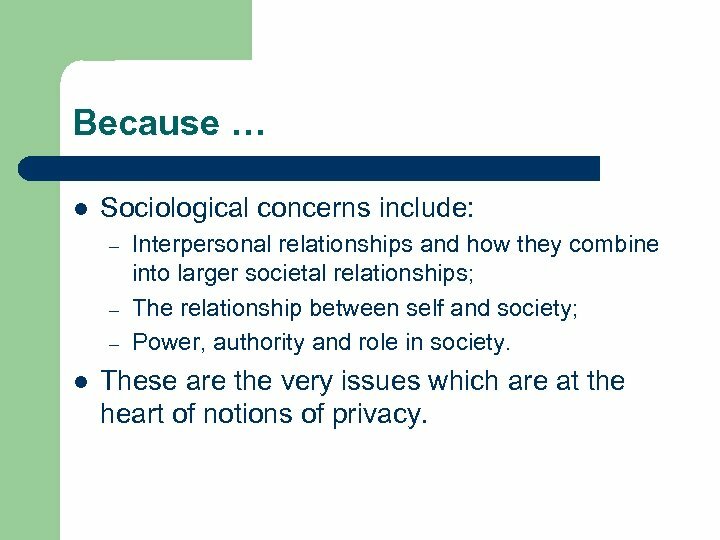 Because … l Sociological concerns include: – – – l Interpersonal relationships and how they combine into larger societal relationships; The relationship between self and society; Power, authority and role in society. 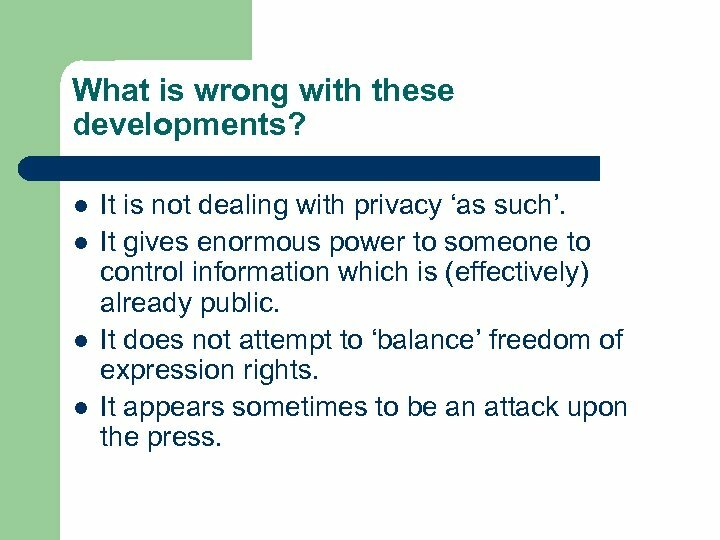 These are the very issues which are at the heart of notions of privacy. 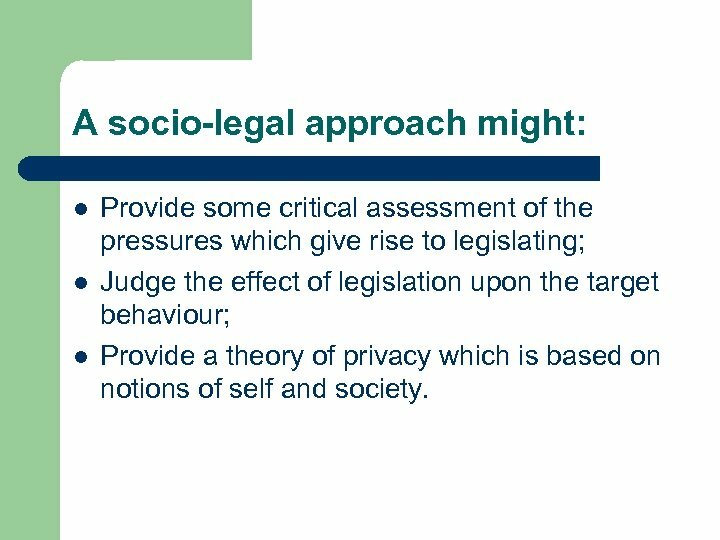 A socio-legal approach might: l l l Provide some critical assessment of the pressures which give rise to legislating; Judge the effect of legislation upon the target behaviour; Provide a theory of privacy which is based on notions of self and society. 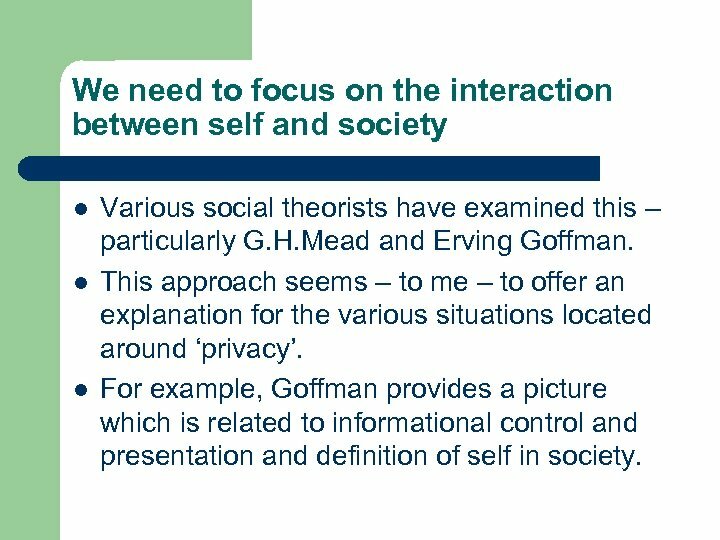 We need to focus on the interaction between self and society l l l Various social theorists have examined this – particularly G. H. Mead and Erving Goffman. 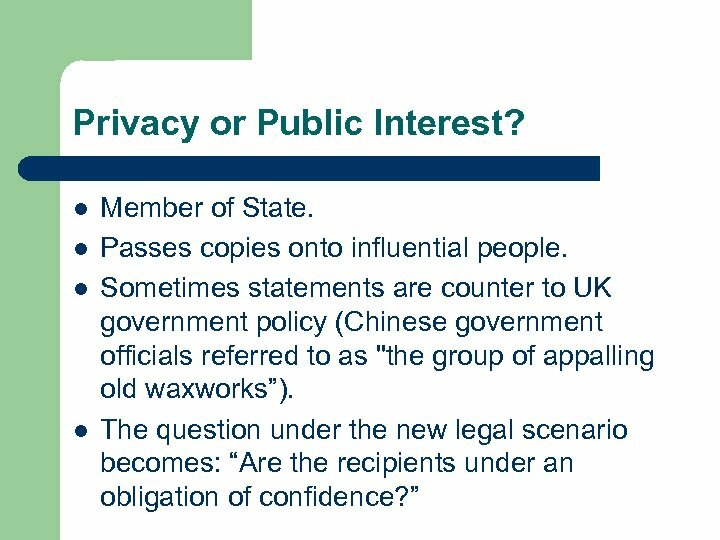 This approach seems – to me – to offer an explanation for the various situations located around ‘privacy’. 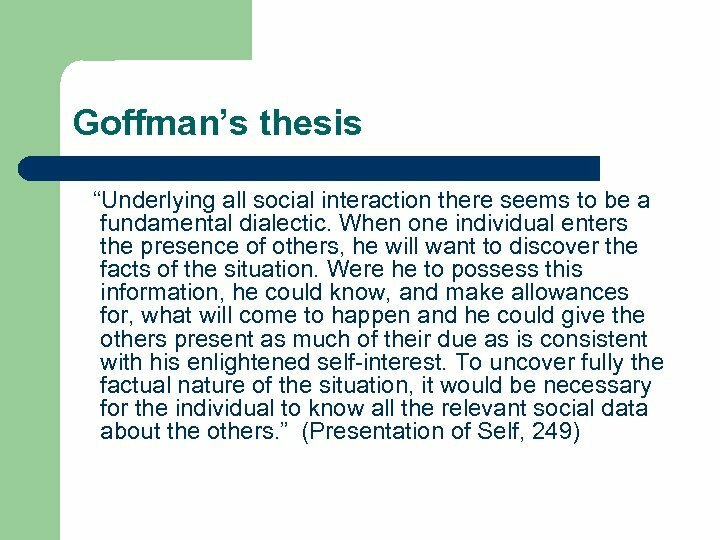 For example, Goffman provides a picture which is related to informational control and presentation and definition of self in society. Why is this important? l l l Because it is about ‘trust’ – we cannot trust those who we know nothing about. Without ‘trust’ there is only a fragmented and dysfunctional world. 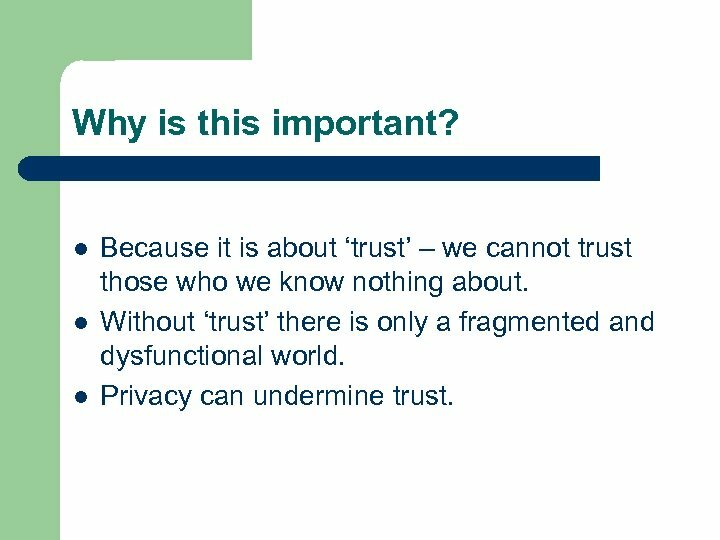 Privacy can undermine trust.